Radebold: It wasn’t talked about much within families themselves, which is regrettable, as is the fact that this film wasn’t made earlier. The protagonists were born shortly after 1920. Very few members of that generation are still alive — and many of those who have survived suffer from dementia. The film actually deals with individuals who are no longer with us. SPIEGEL: Why do early experiences gain particular importance as people age? Radebold: As we get older, there is a softening of the psychological concrete lid under which we have buried our feelings. Our professional life, which had held us together, is over. We see a depletion of our psychological, physical and social functions. Many of us become dependent and start to recall old situations in which we felt totally helpless. Spouses and friends die. The elderly have to mourn their losses. And if they didn’t learn to grieve as children, they freeze up and become depressive, and some even become addicted to drugs and alcohol. SPIEGEL: “Grandpa is talking about the war” — that’s a familiar expression in many families. Radebold: Yes, but the soldiers only told adventurous war stories — tales of heroic exploits. It’s more difficult to talk about horror, fear and panic. And something else happens: When stories are told, the content becomes separated from the affect. Individuals may tell stories from the old days, but they no longer have a connection to what they felt at the time. SPIEGEL: What was your reaction to the miniseries? Radebold: I only saw a quarter of the first episode, then I had to leave the room. My wife saw the whole thing and gave me a detailed description of what happened. SPIEGEL: Why did you leave the room? Radebold: I found it very disturbing. SPIEGEL: But it didn’t show anything that you hadn’t already known for a long time. Radebold: Of course. But something surfaced that lies beyond the intellect, certain feelings. Radebold: Fear and despair. The main figures in the film may be older than I am, but I was 9 years old toward the end of the war. SPIEGEL: Which scenes did you find disturbing? Radebold: The scene in which the first Russian soldiers appear. I am aware, of course, of all the horrible things that the Germans did to the Russians. But, at the same time, in my unconscious mind, there is apparently a certain place — one which reacts to sounds and images — that moves me to see the Russians as the culprits. SPIEGEL: How do you explain that? Radebold: I grew up in Berlin. When we were bombed out of the city in 1943, my mother, my brother and I were evacuated to Berlinchen, some 50 kilometers (30 miles) east of the Oder River, in what is now Poland. My father was a physician during the war. In late 1945, the Russians arrived in our town with tanks. When the pharmacist fired a bazooka, the Russians fired back. SPIEGEL: How did you react? Radebold: We fled out the backdoor of our house and out onto a half-frozen lake. There were cracks in the ice. We ended up on an island, but that was also fired upon. After two days on the run, we came to a small village. Soon thereafter, the Russians took my 15-year-old brother because they needed laborers in the hinterland. There, until April 4, I witnessed everything imaginable. SPIEGEL: Would you like to tell us what you experienced? Radebold: As you can see, this is all very emotional for me. Soldiers’ corpses hung by ropes from trees. And the Russians came every night and took the women. Radebold: We were all herded into a barn. My mother dug a hollow in the hay there, crawled into it, pulled a blanket over herself and told me to lie on top of it. “When the Russians come, they’ll only see a little boy,” she said. And that’s how it was. When a flashlight appeared, the other women were taken away. But I was able to protect my mother. SPIEGEL: Did that foster a particular closeness between the two of you? SPIEGEL: All of these images and memories were brought back by a brief film scene? Radebold: Precisely. Don’t forget, the unconscious has no sense of time. I’m intellectually aware that all of this happened decades ago, but it’s all unconsciously still very present. SPIEGEL: What did you do after you stopped watching television that evening? Radebold: I went down to the basement and continued to work on my model railroad set. SPIEGEL: Did you basically return to your childhood? SPIEGEL: Why does television have such a powerful impact? Many victims of the Nazi regime didn’t start to talk about their experiences until they saw the American TV miniseries “Holocaust,” which was broadcast in 1978. Radebold: Emotions are closely linked to images. The “Holocaust” series also shows everyday images. Images trigger something that we call trauma reactivation. SPIEGEL: Non-Jewish Germans were primarily perpetrators under the Nazi regime, and that is also what’s shown in the film “Unsere Mütter, unsere Väter.” The protagonists kill and betray. At the same time, the film shows the mechanisms that draw people into a web of guilt. The perpetrators also become the victims of totalitarian structures. Are the perpetrators inappropriately exonerated by this? Radebold: The film leaves too much out and doesn’t examine the family histories of the protagonists and their National Socialistic traits. The film barely explains where the fanaticism comes from. SPIEGEL: But isn’t there a problematic aspect to your research approach? If we see the experiences of soldiers as traumatic, we begin to sympathize with them. At the same time, given the crimes committed by the Germans, any form of pity is prohibited. Radebold: Coming to terms with one’s own history doesn’t mean that one is automatically exonerated. SPIEGEL: In an ideal situation, what can such a process achieve? Radebold: … and I was disappointed that it was no longer possible. Later on, I imagined what kind of career I would have had in the Third Reich. I looked like something out of a textbook on racial purity: tall, blonde and blue eyes. Today, I know that after Napola and one of the Ordensburg military academies, I would have probably become a member of the SS. I assume that, when I was 20 years old, if someone had put a gun in my hand and said: “Shoot the subhumans,” I probably would have done it. SPIEGEL: Even within your profession, there were those who had reservations about dealing with war-related issues. Radebold: Yes, and I was on the receiving end of this. I was a member of an interdisciplinary research group called “weltkrieg2kindheiten” (or worldwar2childhoods), which was subjected to massive attacks until 2004. I was personally so closely identified with German guilt that it took me a long time to face up to the fact that I had a traumatized childhood. SPIEGEL: Were the experiences that you’ve just mentioned never an issue during your analysis training? Radebold: No. My analysis instructor had been a high-ranking member of a communist underground party during the Nazi period and led a very dangerous existence. She seemed to feel that my experiences as a child during the war had no bearing on my development. Many of my colleagues have had similar experiences during their analysis training. SPIEGEL: Nevertheless, psychoanalysis produced the decisive impetus for the Germans to reflect on the Nazi era. There was, for instance, the work of your colleagues Alexander and Margarete Mitscherlich, who wrote “The Inability to Mourn,” which was published in 1967 and led many students to confront their fathers about what they had done during the war. Radebold: I hold the Mitscherlichs in very high regard, and our institute in Kassel is named after Alexander. But I find some of their work highly problematic. The title points in the wrong direction. These people weren’t unable to mourn; they had become emotionally paralyzed — and there is a difference. Furthermore, Mitscherlich had previously written another book called “Society Without the Father,” in which he described fatherlessness as a purely socio-psychological phenomenon. But there were 2.5 million children who grew up without fathers in postwar Germany, and he must have treated some of them at his practice in Heidelberg. SPIEGEL: You attribute this blind spot to the Mitscherlichs of all people, the holy pillars of your profession? Radebold: In the early 1980s, Margarete Mitscherlich collaborated with a journalist to write a book about men who are unable to form relationships. They listed 10 examples, seven of whom were children during the war. But the authors make no attempt to connect this phenomenon with the subjects’ wartime experiences. 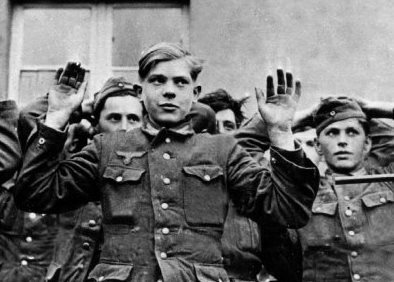 SPIEGEL: Did your patients come to you to talk about their wartime experiences? Radebold: No, they came with symptoms, and it was through the symptoms that I gained access to the horror. One was an entrepreneur whose company started going downhill because he was suffering from insomnia. He could only sleep for two to three hours on a deckchair. It turned out that he had been a paratrooper. He was basically always seeking refuge on his deckchair. But in 1974, when he came to see me, the war was still such a taboo for me that I could not yet ask the right questions. Another patient came from a military family. During the war, as a 20-year-old, he was buried alive in a bunker during a bombing raid and his rescuers toiled to dig him out again. When he came to me in the 1980s, he was suffering from such panic attacks that he was unable to work. After a few sessions, he told me how — for the first time in 40 years — he had dreamt of his ordeal in the bunker again. He soon felt better. SPIEGEL: Why did these men come to you in particular? Radebold: They definitely wanted to talk with a man. Patients who were in analysis with me for a long time began to mourn what happened. I have never treated one of the principal offenders, though. They presumably never went into therapy — at least I don’t know of a single published treatment report. We also shouldn’t forget that psychoanalysis was seen as a Jewish science. But the children of the perpetrators, including some whose fathers were in key positions of authority, have come to me for treatment. I have also treated children of those who were persecuted during the war. SPIEGEL: Why should future generations come to terms with the war experiences of their forefathers? Radebold: Many children have unconsciously adopted the symptoms of their parents. One patient dreams of the tank attacks that his father experienced. The adults have conveyed much more through gestures and insinuations than they realize. This has been absorbed by the children and incorporated into their identities. Parents unconsciously pass on tasks to their children: Carry on with the family, do a better job and protect us, so we don’t decompensate. SPIEGEL: You have two children. Have you passed on fears to them? Radebold: My son was born 1970, and my daughter in 1967. My wife was also a war child. Our daughter very intensively confronted me when she was an adult. That was painful. Her allegations were typical of those who are today between the ages of 40 and 60, and are now in therapy everywhere. They say: You’ve raised us according to standards that you haven’t explained. Why do I have to constantly cover my back? You tried to spoil us outwardly with everything that you didn’t have — toys, our own room — but you weren’t reachable inwardly. You didn’t listen to our “small” problems. They say: Since you had to overcome things that were so much worse, we were given the message that we have to deal with our own problems alone. SPIEGEL: In spite of all this, Germany managed to become a respectable nation. How was that possible? Radebold: According to my colleagues, Germany’s postwar economic miracle was a hypomanic accomplishment. They say that we, the war children and our parents, worked and worked to avoid facing up to our guilt and our trauma. They have a point. But it also has to do with the fact that many came back from the war and began to reflect on what happened. We war children then said: Never again war. The children of the perpetrators have, to a great extent, come to terms with the guilt of their parents. It is, all in all, a good process. But it’s not over. Radebold: I hope that there will now soon be a film about us war children. I would be happy to work on the script. SPIEGEL: Mr. Radebold, thank you for this interview. Dr. Hartmut Radebold, born in 1935, is a psychologist and doctor of neurology in Kassel. One of Germany’s most influential psychoanalysts, he held a chair of clinical psychology at the University of Kassel from 1976 to 1998. He has authored numerous books in the field, including one focusing on the experiences of children who grew up during WWII. Esse post foi publicado em Alemanha, Guerra, História e marcado Alemanha Oriental, crianca alemanha nazista, crianca nazismo, culpa nazismo, DDR, guerra mundial, heranca nazista, I Guerra Mundial, III Reich, legado nazismo, nacional-socialismo, nazismo, RDA por Joanisval. Guardar link permanente.